Over the past few years, the power and significance of spirituality and religion in American life has been increasing. The topic of religion is at the forefront of America's public discussion-in our communities, churches, schools and homes. In "From Jesus to Christ: The First Christians," FRONTLINE presents a provocative, intriguing, and surprising story about a religion that has dominated Western culture for nearly 2,000 years. "From Jesus to Christ: The First Christians" is a four-hour series explores the life of Jesus, his death, and the men and women whose belief, conviction, and martyrdom created the religion we now know as Christianity. Drawing upon historical evidence that has created a revolution in scholarship over the past twenty-five years, the series challenges familiar assumptions and conventional notions of Christian origins. Unexpected archaeological finds have yielded new understanding of Jesus' class and social status; fresh historical evidence has transformed earlier ideas about the identity of the early Christians and their communities. Through engaging, on-camera interviews with twelve scholars-archaeologists, historians, and New Testament scholars-the series presents their contributions to this intellectual revolution. Together they represent a range of viewpoints, a diversity of faiths, and a shared commitment to bring new ways of thinking about Christianity to a public audience. "From Jesus to Christ" reveals that Christianity did not arise as a single, uniform and coherent movement, but as one marked by diversity of opinion, practice, and belief. From the beginning, it was forged by conflict as the early Christians wrestled with Judaism, collided with paganism, challenged the authority of the Roman Empire, and struggled with each other. The series conveys the early Christians' attempt to understand Jesus and the meaning of his message and suggests that their ancient world of 2,000 years ago may not be so very different from our own. This guide for educators contains activities and ways to use the film's historical and contextual information in History, Religious Studies, English Literature or Psychology classes. The film's content provides entry points for discussion, critical thinking and research about the history of Christianity and the Roman Empire, what it takes to be a "founder," the nature of oral versus written storytelling, and role of religion in society. There are two classroom activities as well as a series of provocative questions to ask about additional topics raised by the documentary. Whether you use the activities with or without the film, we hope you find them useful and that they spark interesting classroom discussions which offer insights into the history of Christianity and its relevance to religion and life today. The timeline will show major events in Christianity from the birth of Jesus through the 4th century. These activities will help spark interesting classroom discussion and encourage students to further their own discussion and research. Students will be asked to think about important or famous "founding figures" (whether national heroes, ethnic icons, or religious leaders), both as historical characters and as icons or symbols for later generations and group identity. Large group and small group. Research extension. The lesson is designed for one class period. Prepare a list of names and characteristics of founding figures in order to prompt the group discussion in Step 1. There may be discomfort in the group if different people select different "founders" as most important to them. Be prepared to facilitate the resulting discussion. If you expand the lesson using the follow-up survey, you will need to prepare a sample survey form. Alternatively, students can discuss what questions they should ask in their survey and prepare their own. Using the notion of Jesus as the "founder" of Christianity, ask the entire class to (a) identify the general characteristics of such a "founder" or "icon," and (b) propose some other names that they think of as important founding figures. These may be national heroes (George Washington, Thomas Jefferson, Susan B. Anthony, Benito Juarez, or Joan of Arc), ethnic icons (Mohandes Gandhi, Martin Luther King Jr., Malcolm X, Mother Theresa), or religious founders (Moses, Jesus, Muhammed, the Buddah). Discuss or have students research the "story" and write a brief biographical sketch for each person listed. Hint: You could also start by listing names and then help students develop the characteristics as a second step. Compile a list of characteristics or accomplishments associated with each person. Notice any similarities or differences. Does it make a difference that some are considered religious leaders and others are national or ethnic symbols? Why? Why do some seem to fit in both categories? Hint: Sometimes ethnic or national icons are also religious leaders, since religious self-definition is often instrumental to personal identity, especially among minority populations. In other cases, the ideals of such a figure are viewed by later generations as national or ethnic values, as in the case of Thomas Jefferson, Abraham Lincoln, or Martin Luther King Jr. Notice that a number of these figures were also "martyrs" for a cause. Were these people as well-known in their own time as they are now? What did others think of them during their own lifetime? How and why do their stories get told? Why do the stories about these people differ? What difference does it make if some of the stories about a figure (like George Washington) turn out not to be historically accurate? Why did different groups in the class choose different figures? Which is more important-what the person really did or what he/she represents to later generations? How does this help us think about what an important figure symbolizes to an individual or group and how another figure may be important to others? Who are likely to be the important founding figures in the future? Why? As a homework assignment, ask students to conduct a survey or poll of family or friends asking them to identify the most important founding figures to them. Students can brainstorm about the questions to ask, or you can distribute a survey form you have created. On completion of the assignment, ask students to assess common threads as well as potential ethnic or religious similarities and/or differences and other historical trends. Program 1 shows how new discoveries from archaeology and historical research on the times changes our perception of the story of the life and death of Jesus. Program 3 describes how the later Gospel stories developed as each was told and retold in different religious communities facing new circumstances, where growing tensions between Jews and Christians became an issue. Students will be asked to think about the nature of historical inquiry and the power of story and tradition, including issues relating to the emergence of antisemitism (or antijudaism). The outcome should show how telling the story reflects the situations and needs of the storytellers. After viewing the program(s), Part One may be completed in two class periods (with a written assignment in between). It may also be expanded to encompass more sessions for purposes of working on the "newspaper" mastheads and layouts as desired. Part Two may be completed in a single class period, but may be expanded to more than one class session using the experience of storytelling. For Part One, if you choose to use newspaper mastheads, you may wish to prepare them ahead of time. Print the timeline, for students to reference. For advanced classes, you can obtain additional information about other messianic rebels at the time of Jesus, the Essenes and the First Jewish Revolt, the Christians in the Second Jewish Revolt, etc. Transcripts of the programs are also available on-line. I. Who Tells the Story? Give each group a brief description of their assigned society's point of view. View Programs 1 & 3 (may also be done after viewing all four programs). As they view, ask students to consider the information from the perspective of the group to which they have been assigned. Based on information provided in the program, have each group write an account of what happened in the death of Jesus and why. Hint: Have each group write its account in the form of a two-part newspaper spread. Each report should include (1) an obituary or brief biographical sketch on "who was this Jesus?" and (2) an editorial column describing differing accounts and interpretations from "interviews" as well as "probing analysis" of the events and their significance from the perspective of the time written. (Note: each report should be based on the type and extent of information that might be available to each reporter). Hint: Assign (or let each group create) a masthead for its newspaper by where and when written. The Galilee Chronicle-Telegraph (a regional Jewish newspaper, circa 125 C.E.-editorial stance is in-group and pro-Jewish, but after the split with Christianity). Allow time for discussion of the editorial perspective of each newspaper. How does the perspective of the reporter and the times and circumstances of the telling influence the story? What kinds of information might be unknown or overlooked in some of the accounts? What constitutes "hearsay" information and what is reliable? What should the editors of each newspaper consider? Which account is the most accurate (or "historical") and what difference does it make? What other kinds of issues show up in the "slant" of each account? What things help you to recognize that a story has a "slant"? If you did not use mastheads, ask students to identify which article was written by which group. How did they know? II. How does Storytelling affect the Story? Since Jesus did not write anything, the progress of the tradition passed from oral to written accounts in stages. Conduct a discussion of the nature and character of oral storytelling. Begin by asking the class to develop a list of characteristics of oral storytelling based on their own experience with things like fairy tales and folk legends as well as issues that come out of the program. When and why do some stories get written down? (Hint: Oral tradition tends to develop in small blocks, usually beginning at the famous part of the story, i.e., at the climactic events, and working backwards from there. This may be called the "Superman effect," since Superman's birth and rescue from Krypton developed much later than the stories of his mighty deeds on earth. Why are some traditions preserved only in oral form? What are the advantages and disadvantages of oral storytelling? The move from oral to written often requires a catalyst. What event/s served as a catalyst for the development of the Jesus story and how did they impact the story? How do the different written versions of the stories reflect the ongoing process of storytelling? What circumstances or situations help to explain the differences and the similarities? Why are there changes when stories are repeated in oral form? How does this affect our notion of History? What does this say about the religious attitudes or faith of people who tell the stories? In particular, how does the historical evidence regarding the actual death of Jesus cause us to rethink how we use these stories today? Prepare students for the above discussion by focusing a class period on oral storytelling. Ask one or two students to volunteer to tell a story: for example, "how my family came to America." Students should listen to the story and write it down. Next they should compare the accounts that they wrote, noticing which information was retained, omitted, and how the focus of the story might differ from person to person. Alternatively, ask one or two students to tell a traditional story (such as Superman or the fairy tale. [If you choose more than one, you may wish to keep each one from hearing the version of the other.] Then, have the class write down the two versions and discuss the differences. Today we think of Christianity as a separate religion with many distinct denominations or sects within it. How does the history help us to understand this development? Programs 2 and 3 show that what we now call Christianity was originally a sect, alongside other sects, within Judaism. What problems arise when a minority group begins to admit outsiders? How does this help to understand the situation of Paul in his mission to Greece and Turkey? What is the impact on the early Jesus Movement? What factors contribute to the development of such groups over time? What is the effect of the destruction of Jerusalem or the Bar Kochbah revolt in the separation of Judaism and Christianity? 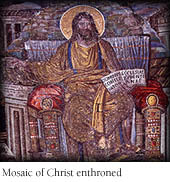 Program 4 looks at how the Christian Movement grew throughout the Roman Empire. How did the Jesus Movement, which began as a sect of Judaism, become a separate religion? What difference did it make to people in the Roman Empire? What was the legal status of the Jesus Movement? Were there persecutions? What changed when the Christian Movement began to separate itself from Judaism? What was its legal status? What situations show the difficulties that Christians faced? It does not appear that Christians had to hide out from the Roman authorities in order to worship, even during the early periods of persecution. What was it that made the Romans nervous about Christians? Why did the Christians feel so estranged from Roman society? What could you say to people who feel this way today? 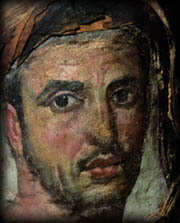 When Romans looked at early Christianity what did they see? Are there any similarities today? Did Christianity look like one single form of new religion? Was the diversity of Christian belief and practice a problem? Why were there so many different forms of Christianity in the early centuries? What happened when Constantine made Christianity a legitimate religion? What was gained and/or lost? Do you identify more closely with the imperial triumph of the church or with the persecuted minorities that got shut out of the picture? Why? For additional discussion questions, please refer to the Viewers' Guide for "From Jesus to Christ: The First Christians"
Modern archaeologists and historians use these two terms to indicate dates: B.C.E. means "Before the Common Era" and is equivalent to B.C. C.E. means "Common Era," equivalent to A.D. The terms are meant to be inclusive, rather than just using the traditional Christian terminology, but the calendar is still the same. This is the region of the Roman Empire that was the birthplace of Jesus and the traditional homeland of the Jewish people. There were several different names used for the area in ancient times. The Greeks gave the name Judea in about 300 B.C.E. to the region around Jerusalem (see Map 2), as a translation for the name of the majority ethnic population. It is this Greek name from which we when the size of the territory was enlarged, Judea was used to refer only to the southern portion of Herod's kingdom. Later, the Romans renamed the entire province Palestine, and that is the name that was used down to modern times. In the ancient world, this word referred to the place where a divine presence or spirit dwelled. Temples were places for animal sacrifice, and they also served as banks, national landmarks or capital centers. 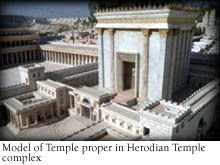 Among the most famous temples was the Jewish Temple in Jerusalem, rebuilt by Herod the Great, whose ambitious building program was begun in 20 BCE and required 80 years to complete. This magnificent structure attracted both Jews and Gentiles alike; it also symbolized the special relationship between the people of Israel and their one God. When Jewish resistance to Roman rule erupted in the First Jewish Revolt against Rome, the Temple was destroyed, and its inner sanctuary violated and plundered of treasure. Only 20 years after it s completion, the Temple lay in ruins. This Greek word means "assembly" or "congregation" and was used to refer to many different types of gatherings. Over time, and especially after the destruction of Jerusalem in 70 C.E., Jewish worship shifted from the Temple as the center to this congregational setting. The term came to be the designation for a Jewish assembly and later referred to the building in which a Jewish congregation normally meets. Some Jewish groups today call their synagogue congregation or building "temple," as a sign of reverence for the assembly and worship. This term to designate Christian congregations and buildings comes from German and English (kirk) usage in the later Middle Ages. It, too, comes from a Greek word, ekklesia (or Latin: ecclesia) from which we get English words like ecclesiastical. The Greek word originally meant "assembly" or "congregation" and could be used interchangeably with synagogue by both Jews and Christians. Over time, however, "church" came to be the designation for Christian congregations and later their buildings, just as "synagogue" came to be the distinctive term in Jewish usage. Antisemitism is hostility by a person or group toward Jews individually, Jewish people collectively, or Judaism as religion. Antijudaism is the particular form of antisemitism that evolved among Christians based in part on the allegation that Jews, either individually or collectively, were responsible for the death of Jesus. Sects tend to be breakaway groups within a larger religion, thus: a religion is a system of symbols and rituals that serve to define the social order of a particular cultural group by providing a belief system that orders the world, mechanisms of group identity and solidarity, and a value system that motivates ethics and social behavior. A sect is a deviant or schismatic minority group that tends to feel tensions with the dominant or majority religion but shares the basic set of religious beliefs and cultural identity issues with the majority. You can also send E-mail to video@pbs.org. Funding for this viewer guide is provided by PBS and the Arthur Vining Davis Foundations. It was created by educational consultant Simone Bloom Nathan, Ed.M., and Jim Bracciale, Rick Byrne, and Emily Gallagher of FRONTLINE's communications staff. The writer is L. Michael White, professor of classics and director of the Religious Studies Program at the University of Texas at Austin, with input from high school educators Susan Lawrence and Steve Zipko. The executive producer for FRONTLINE is Michael Sullivan. The senior executive producer for FRONTLINE is David Fanning.